Tempo and Speed: Want To Come Over and See Our Vacation Slides? Want To Come Over and See Our Vacation Slides? 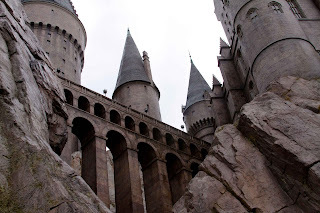 Even though it has been a few weeks and many other exciting life events have occurred since our trip to the Wizarding World of Harry Potter, I must post another batch of photos and commentary about our trip. 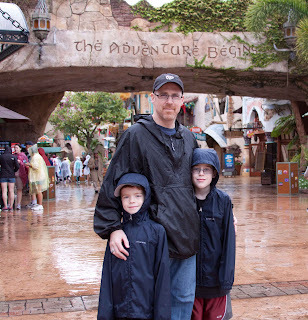 It was such a fantastic time for us all and I'm all about saving memories here on this blog. This may be a bit like inviting you over to view our vacation slides minus the actual slideshow. And I'm not serving you dessert. But bear with me while I show a few highlights. Really, it will only be a few. Where else to begin but where the adventure begins? Here is handsome hubby with the two extremely excited Potter fans at the park entrance. 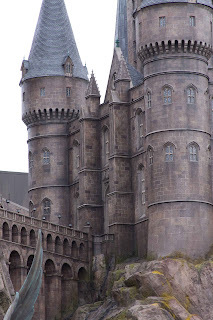 It was a perfect day to visit Harry's world. By perfect I mean it was rainy, dreary and cold. Very appropos weather for visiting England. 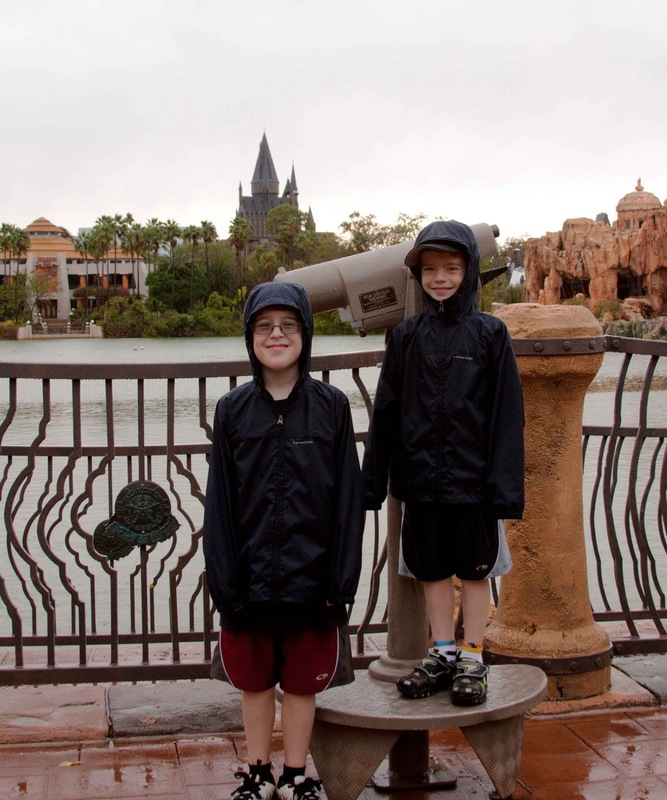 But the weather did not dampen any spirits as is clear in these happy faces as they had their first view of Hogwarts in the distance. 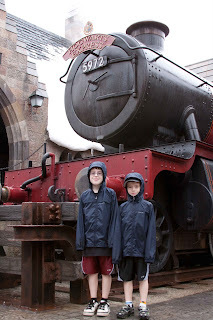 You would have thought the boys were really about to board the Hogwarts Express by their level of excitement. I know it's hard to tell from the pictures, but they were beside themselves. And don't worry. They regained the use of their arms in some of the later images. 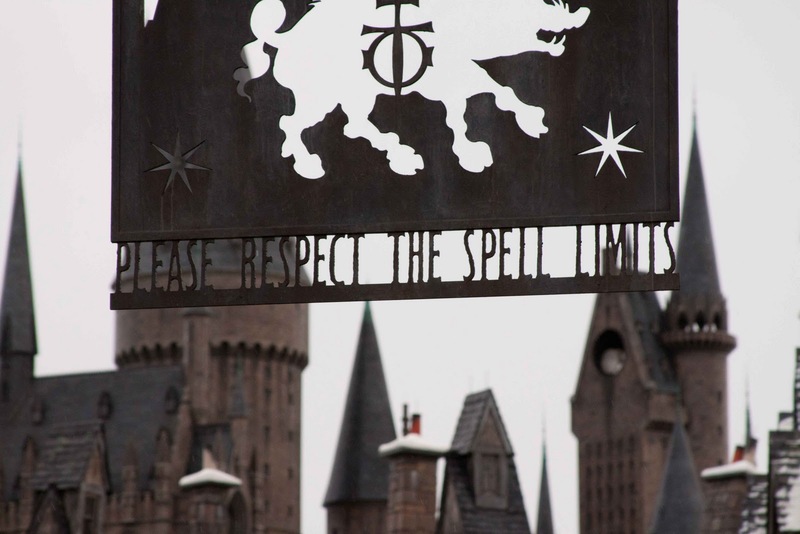 And their hands showed back up in the afternoon. 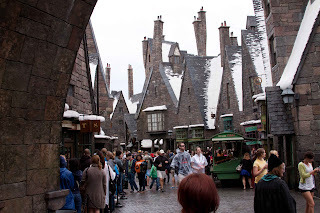 The people at Universal did a great job of replicating the village of Hogsmeade complete with cobbled streets and wonky chimneys. The only things out of place were the shorts and flip flops. 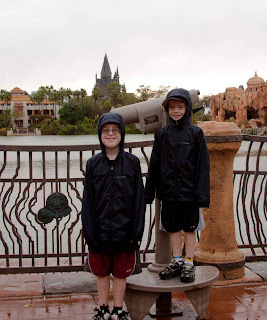 Even though it was cold and dreary, some of the tourists insisted on standard Florida attire. 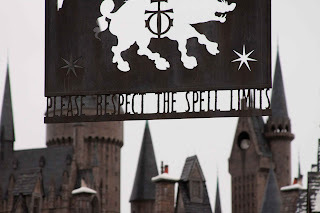 The non-wizard dress was allowed but there was at least one rule that was clearly stated and enforced. We really felt like we were in the middle of J.K. Rowlings' imagination when we approached this. I think we should take a break from the slideshow for a bit. I'm going to have some dessert now. Maybe you could go have some too and come back later for the rest of the vacation pictures. Really, there are more. These are great! If I go back to Florida (which is not terribly likely unless it's on business) I want to go there! One of the band kids went over spring break; she said it was so awesome!